Rachel K. Dooley is the Creative Director for In These Times. Rachel has been with In These Times since May 2005. She has overseen the transition and redesign of the small national bi-weekly to a larger glossy monthly—all while ensuring deadline was met. She manages the art department designing every issue from concept to production, both for print and for the web (InTheseTimes.com). 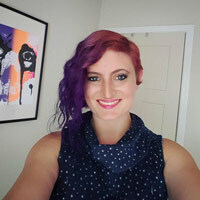 She manages freelance illustrators, photographers, print vendors while working closely with the editorial staff to coordinate all the aspects that go into producing a high-quality monthly. She also works with development and publishing departments to plan and maintain the publication’s visual branding standards and fundraising strategies. Rachel specializes in design solutions for nonprofit organizations—past clients include the PBS’s POV, Environmental Protection Agency, Kartemquin Films and the National Association for Multicultural Education. She has volunteered with for Project Philanthropy and is a former executive board member of the Midwest Brain Injury Clubhouse. She has been an active member of the Best Buddies program since 2001.